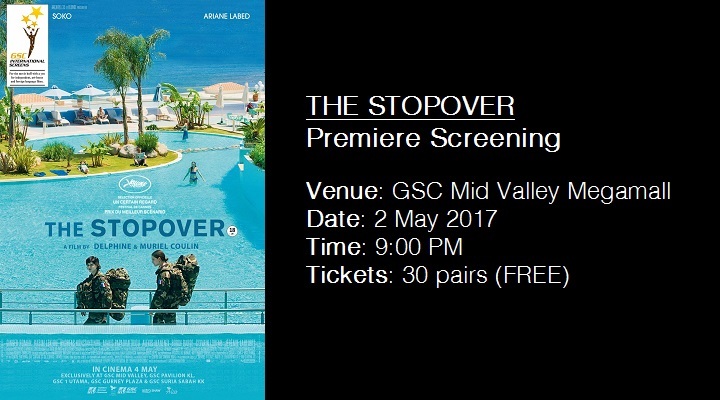 Golden Screen Cinemas (GSC) – International Screen and ColourlessOpinions.com are collaborating for the first time to present you the Malaysian premiere screening of The Stopover (Voir du pays) — an award-winning French drama directed and written by sisters Delphine and Muriel Coulin whose previous film 17 Girls (2011) also won an award. The Stopover won Best Screenplay and was nominated Un Certain Regard Award at the Cannes International Film Festival 2016. It was also nominated for the Golden Pyramid at the Cairo International Film Festival 2016. It currently holds a 100% score on Rotten Tomatoes. Tickets: 30 pairs available. Free of charge. Free seating. Redemption begins 8:00 PM onwards. Maximum two (2) tickets per person on first-come, first-serve basis. While tickets last. How to Redeem: Using your mobile phone, simply present a snapshot of this post (yes, this very one that you’re reading now right here), and the one posted on our FB Page, at the Ticket Entrance of GSC Mid Valley Megamall at 8pm on the screening day. There will be a redemption table there with nice people giving away the tickets until they’re all taken. Pro Tip: Try to be there before 8pm and queue up before anyone else! I’ve already seen it and it’s a great drama (stay tuned for full review). If the turnout is good, there may be more free screenings from here in the future so please do go and catch the movie at the premiere!